Do you have students who have absolutely no interest whatsoever in reading a book? Doesn’t it just break your heart! You’ve tried everything in your bag of tricks to share your love of books, but nothing has worked. The thing I found interesting about these students is, their lack of love for reading doesn’t necessarily mean they are poor readers. In fact, I’ve had some high readers who never read for pleasure. Sometimes I’ve found the trouble is a limited attention span. These students are often overwhelmed by all the words they see on a page and shut down mentally when they see a book that has “too many pages” (their opinion). These students do better with non-fiction books because the reading is divided into bite-sized pieces. 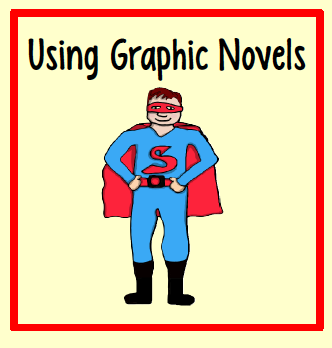 Graphic novels are another type of book that will hold these readers’ attention. Here’s a great article you should read. These books appeal to boys and girls. 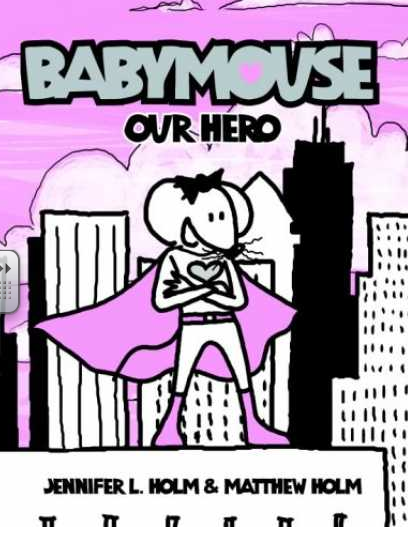 A favorite of my students is the Baby Mouse series. Boys love all the ones about Superheroes. Available at TPT for $4. Isn’t the clipart cute? Teacher Tam made it. Go check out her great stuff! Thanks! I'm glad you could use my clipart! I found a great book called "My Mom Has X-Ray Vision" by Angela McAllister that should be added to your Book Center for this lesson. Starting with that source I came up with the idea to have students make Mother's Day comics with their mothers as superheroes. Upon an internet search on the subject, only days after your post, I found your lessons. Great minds think alike! I am using your lesson tomorrow morning as a demonstration lesson for *hopefully* my first teaching job. Thank you!! !